This is an excellent top-down 2D shooter by the freeware developer of Icy Tower and the Alex The Allegator series. 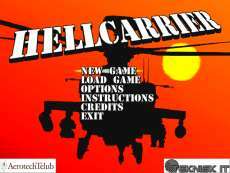 You play a successful helicopter pilot flying for the UN on various missions to eradicate terrorists. The game is quite typical as far as its genre goes, but it is very well executed with smooth graphics, solid user interface, and a diverse set of missions. One of the neat things about the game is that you can select your co-pilot, who will handle the gun and repairs during your missions. His/her skill in the various fields greatly affect your performance in the game (some are sharpshooters but lousy at repairs, for example), so you must carefully select the co-pilot with skills that are compatible with your playing style. The missions range from retrieval to bombing the terrorists' base - again, nothing out of the ordinary, but the well-balanced gameplay makes the game's lack of originality irrelevant.